Whether you are developing a character, creating a brand, or building a venue, I can handle all of your previs and design needs. Any digital sculpture or 3D model can be turned into a real-world object. Much of my experience at Legacy Effects involved creating digital assets for films and commercials. These assets were then 3D printed for use as a props, suit pieces and maquettes. 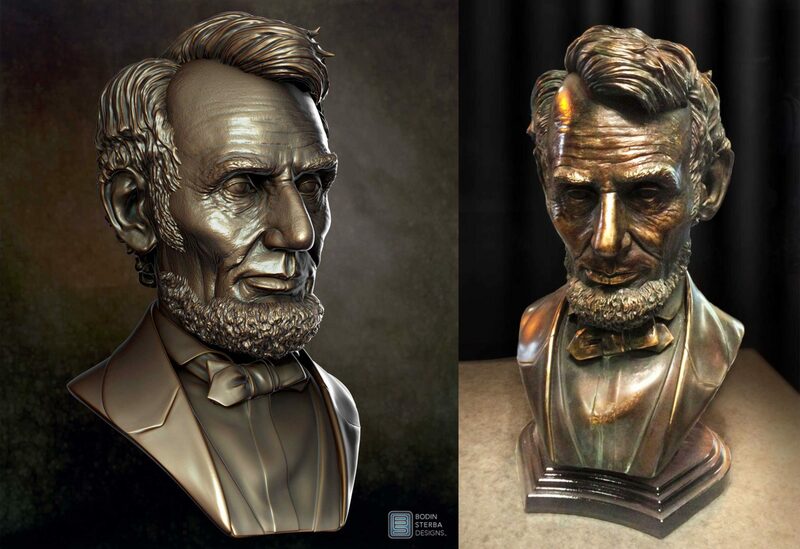 Here is a bust of Abraham Lincoln that I digitally sculpted for Stratasys, the world leader in 3D printing technology. They wanted to have a life-like bust to demonstrate the printing capabilities of their Objet printers. After a few weeks of studying reference photos, I created this digital sculpture which was 3D printed, painted, and then displayed at Siggraph 2013. Whether your character or suit is for film, commercials, print, or web, I can give you an asset that will work in all formats. This past year I was tasked out by Legacy Effects to create Lebron James’ suit design for the Nike Superhero Elite Collection. We were asked to take visual cues from the shoes and create a whole suit. Lebron’s suit needed to look strong, powerful and geometric, so I designed the suit to have a lot of sharp angles, and also to incorporate the carbonfiber elements from the shoe. Initially I created 2D concept sketches, as seen on the left, but I then created a full 3D model of the suit which I rendered and composited for the final image, on the right. Nike used renders of this 3D model in their marketing campaign. Left Image: Initial 2D suit design sketch. 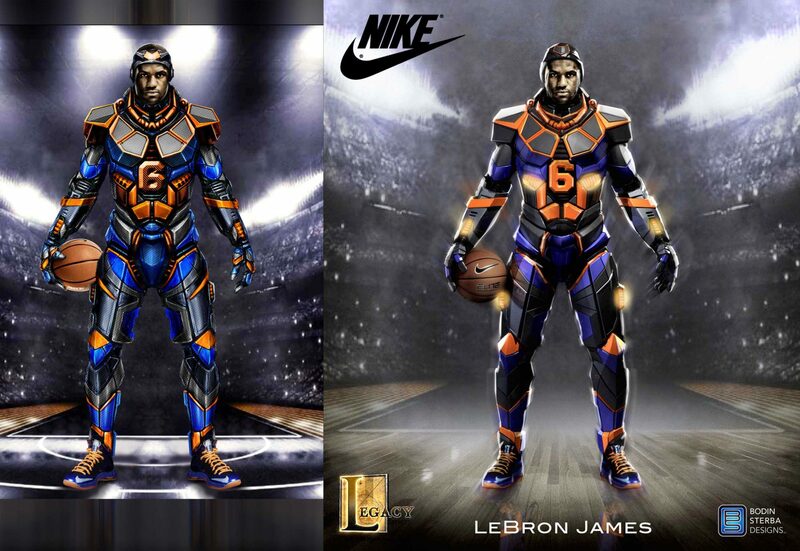 Right Image: Final render and composite of Lebron James’ Superhero Elite suite which was delivered to Nike. Often a concept begins with a rough sketch. I then develop the idea into a 3D model. 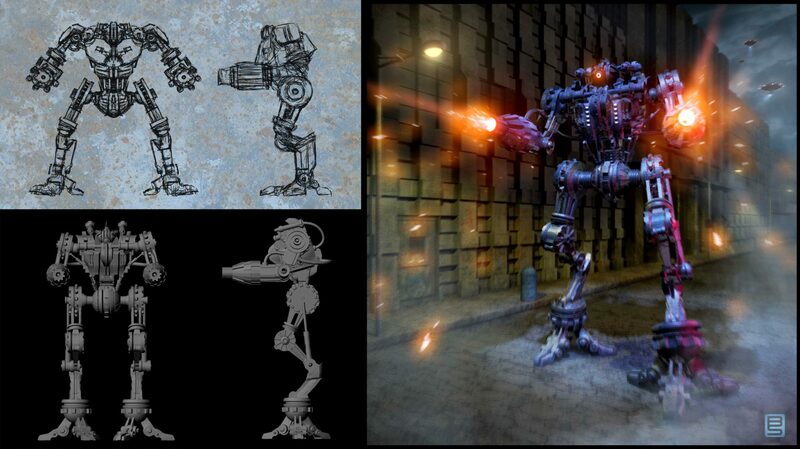 These initial robot sketches were used as reference to build a 3D model in Maya, which was rendered and composited. Often directors wish to see their character posed in a scene as though it was a frame in the film in the commercial. I make it my goal to bring your characters to life. Left Images: Robot ortho sketches and 3D model. Right Image: Final composited design. Through logo designs, brochures and pamphlets, I can I can help you create the visuals for your brand. This is a page from Mandy Ingber’s Yogalosophy business deck I created at The Studio El Segundo. Mandy came to The Studio El Segundo to help brand Yogalosophy and to launch her new website. We worked with Mandy to create a bright and clean look that complemented her fitness lifestyle brand. Mandy Ingber Yogalosophy business deck designed for The Studio El Segundo. I can help you promote your business with large-scale canvas posters. I have had the privilege to design not only Brewco Manhattan Beach’s logo, but all of the interior artwork as well. Here is my Brewco Extreme Beers poster. On the right is the 53″ x 63″ canvas print after it was just hung on the wall. 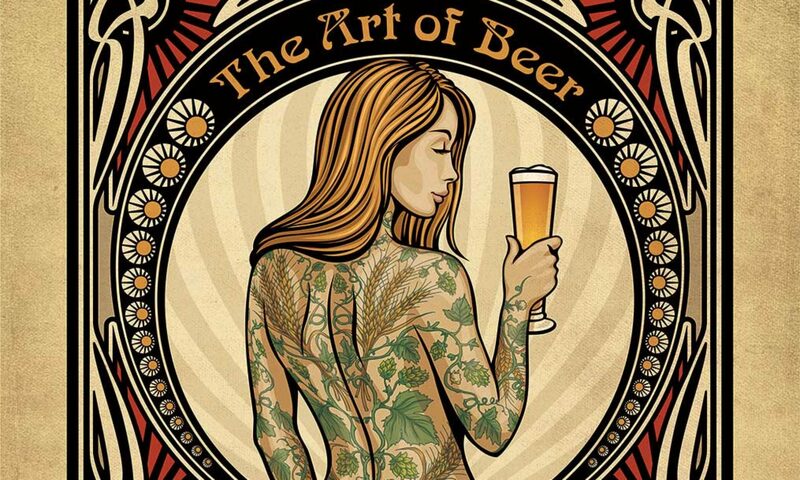 This, along with all of the Brewco posters are displayed on rotation at Brewco Manhattan Beach. Left Image: Brewco Extreme Beers poster final design. Right Image: The printed poster on canvas, desplayed at Brewco Manhattan Beach. If you are building a venue, or creating a retail space, I can help you visualize the final concept. With 3D models, I can generate interior and exterior renders of your venue, and also give you virtual fly-through of your new space. 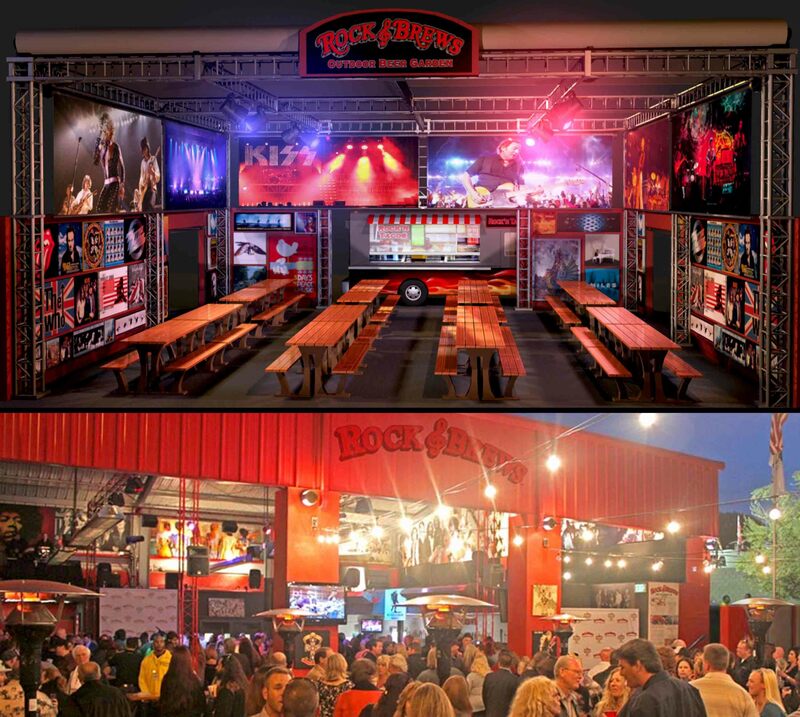 Much of my work at The Studio El Segundo involved developing environment designs of what is now Rock & Brews, a rock & roll themed beer garden franchise co-partnered by Dave Furano, Michael Zislis and Gene Simmons from Kiss. This is a render I created for the Rock & Brews Beer Garden concept. This was used as visual aid for potential investors. The bottom image is a photo of opening night at the Rock & Brews Garden on Main in El Segundo, CA. Top Image: 3D environment model render of the Rock & Brews Beer Garden concept. Bottom Image: Opening night at the Rock & Brews Garden on Main in El Segundo, CA.